This page is made specifically for your feedback about my spartan wars calculator. I will be glad to any of your comments. Especially if you share a link to the calculator using facebook or google+. — How mush units you send on battle? — How much units defender has? — How much units you and defender lost on first/second/… turn? — Which god you use, which bonus that god take? Thorsten: I have checked with the software «Spartan wars Calculator 1.6″ (which calculates the troops needed for cave without any losses if the results are the same. They were not. And of course, my application can have errors or mistakes so if you see something what my app calculate wrong just send me message or leave comment here. Запись опубликована в рубрике Spartan Wars, Игровые Калькуляторы, Экономические Стратегии с метками English, IOS, Ipad, MMORG, Spartan Wars, Стратегии. Добавьте в закладки постоянную ссылку. after the update it is not longer possible to have more than 1 kind of units selected. Example: If I select Swordsmen as defending unit and enter the number I cannot add any further other units like spearmen. If I than klick the «x» the box «defender army» is completely empty and there cannot be selected anything anymore. New version 1.1.1 was deployed. Looks like I fixed that issue. first thanks for fixing the first topic. Now works fine. 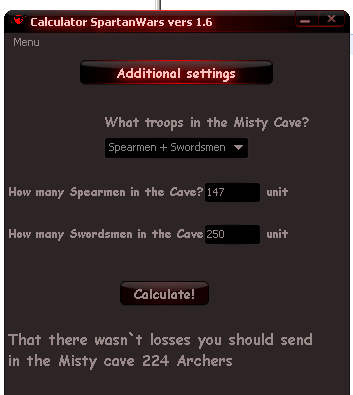 I have checked with the software «Spartan wars Calculator 1.6» (which calculates the troops needed for cave without any losses if the results are the same. They were not. E.g. in the software for 3410 Spearmen and 269 Axeriders 7506 Axemen are needed to have no losses. In your calculator I will have 191 losses. With 9500 Axemen I will also have no losses with your calculator. I could not try the software given numbers for this example but I tried the Software with 2 other combunations in the cave which worked with the given numbers (I did not get any losses). Please include the Calculation with a catapult also help. New version 1.2 was deployed. In that version I included that units. but the Calculater not calculate whit this…. Cave Lv6 Cav 7432, Lancer 743. I attacked with 13.2k Spearmen I have research of spearmen on level12 and had a god with attacking skills. 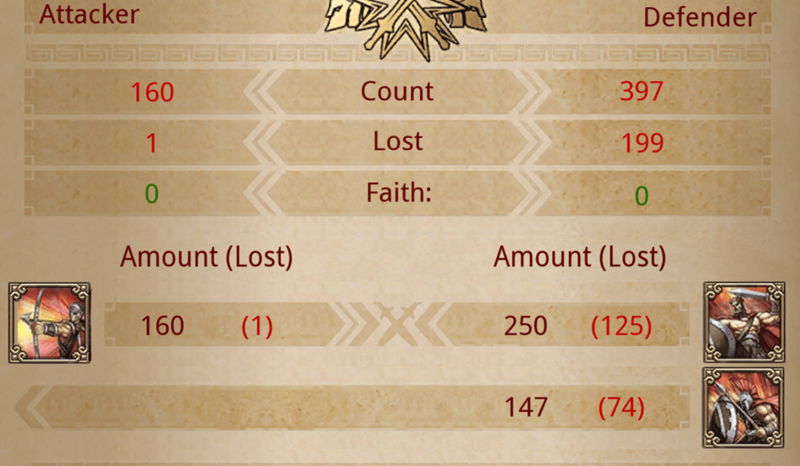 Anyway I had 425 losses. Your calculator said 0 losses. So in any casses you will have losses. Of course it is not the same as in your example, but you use god and researches, so I think it normal to have lower losses. 3. Can you add God’s skill in mext update ? 2. Not sure I understand your question. Tech level only goes to 20? also, does not include wall strength 3% lvl to defensive units. Hi! I’ve input some army for defender, and then looked at best way to go so i won’t have any loses. But for my surprise, all combos were with loses. I’ve tried manually to find a combo so i won’t have loses, but wasn’t to successful. Does this means that there might be a situation were you can’t do anything about it, and you’ll loose for sure some troops? The army of defender was not large (barley reaching 100k). I was wondering if it was possible to post the equation you used to calculate these results. I’ve been going through the math for two weeks now and unable to re-create the formula you have used to simulate the army battles. Found today your calculator and I believe it’s fantastic. Used till now the «swcalc.com» but became useless for me starting with it’s level 8 cave. No need to say it does not provide a real army calculator for any kind of battle. Anyway, you did a really great job, but my reason here is actually a bug/ glitch, whatever… I simulated an attack with lvl 8 cave (39333 swordsmen, 23137 spearmen and 8368 archers) defence on the regular calculator (let’s say PC version), than I double-checked the result on the IPad version calculator link you provide. The results are not the same although I set exactly the same quantities and tech values. On the PC version with 7956 cavalry I should have no losses, while on the IPad version with 10k cavalry I still lose the battle and half of my army (tech level 17 in both swords and equestrian). one of the versions has a problem. Usually I try not to assume anything, since the assumption is the mother of all major f*ck-ups, but my guess the faulty one is the Ipad version, since is newer. I’m glad someone dedicates so much time refining such a usefull tool and I hope that your effort is somehow properly rewarded. 2. After introducing the values for the defender army (and no value at all for the attacker), the calculator provides best options for the attacker army. In the cases I saw, there were a couple of zero losses options, followed below by 2-3 minimal losses options. I manually increased the values for the attacker army in the minimal losses situation until I got back a zero losses result. Wouldn’t be easier for us that calculator provide from the start zero losses situations, whatever large the attacker army might be required?! Fighting a Level 7 cave against horses. 2689 Calvary and 1625 Lancer. With research set to 0 it said send about 37k spearmen for no losses. 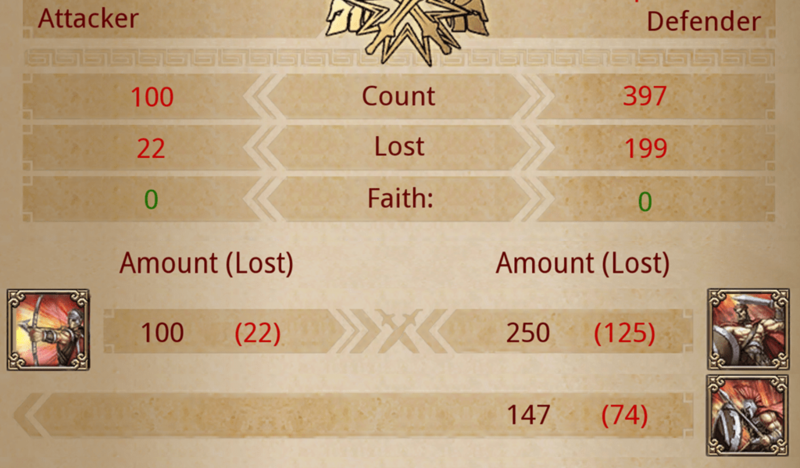 I sent 37800 spearmen and lost about 550. Not sure why. I had level 14 research for spearmen and heavy infantry so I could have sent even less for no losses according to calculator. Watching the replay this was with no critical hits too. If you send spear-men against lancers you will still lose units regardless of size. Both units fight with spears so only the infantry vs cavalry bonus applies. Spears vs spears just kill each other. I simulated an attack against 1 gladiator vs 1 archer even though the gladiator is 830 power vs the 94 of the archer I still lost 1 gladiator on the results. My guess is that you still need to counter the weapon when fighting mounted units. Can you use your calculator to figure out how to win in the conquest mode and get 3 stars? 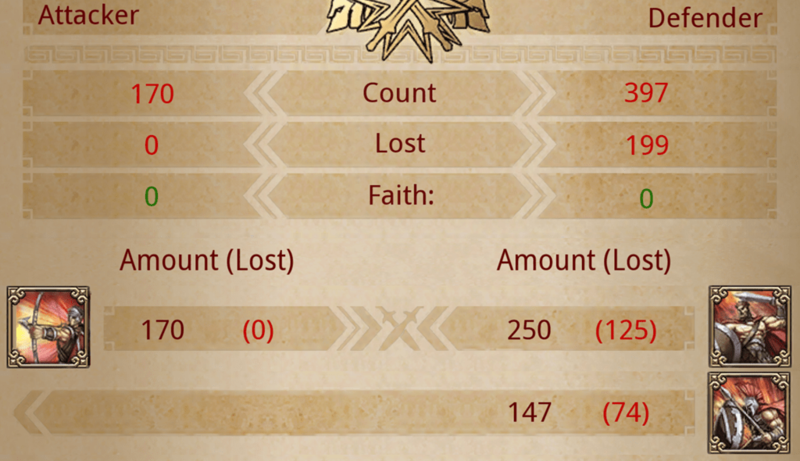 Do you know if it is possible to win in conquest with 3 stars and not have any losses? If you calculator does not work for this, can you suggest any site that can give the troops to use to win 3 stars in the conquest battles? This new version of the Calculator is not working properly. For some reason this is the way its been active for over a week. It says that 12898 spearman will kill 1600 archers if I send 10k. Lol I only need a few archers to win that battle, please fix. Little issue: I cannot set researches higher than 20. Would be great if you could fix that. 3 pike have power 3×34=102, 3 axe have power 3×54=162. So axes kill all pikes and pikes kill one axe. Because to kill 2 axes you need 2×54=108 power. Any chance you adding levels 21-30? Or should we just calculate that stuff ourselves since by the time you are engaging those cave levels you would probably know what’s up? I don’t however. I can provide you the unit info on those levels. Hey leute kann mir jemand helfen ? Will mit gladiatoren die Höhle Alptraum machen wie viele gladiatoren brauch man für die einzelnen Höhlen um sie verlustfrei zu bewältigen ? Hello, i used your calculator for caves 1-6 no problem yesterday but today for 7-10 i am getting duplicate troop types in the calculated values. For example in Cave 10 I got two axerider values and two lancer values in the result? It happens for every cave 7-10. I havent checked others.